I am just getting caught up with blocks for The Splendid Sampler with Block 13 Scrap Stars by Cory Yoder, designer from Coriander Quilts . This week I am taken with the color green! The block I made included Amy Butler, Moda, Dear Stella, Tula Pink and Denyse Schmidt fabrics and I pieced using Aurifil 50wt thread. The Clearly Perfect Angles mat from New Leaf Stitches was a massive help for me with this block! I ordered new embroidery needles to make the block 12. Mine were not being finger friendly so I asked for suggestions to make hand work easier. Do you have a favorite embroidery needle? You can join The Splendid Sampler at anytime! The blocks are available for you to make at your pace! There is a very active and fun Facebook group that you can join to share your blocks for a real online sew along experience! Looking forward to seeing your creations! 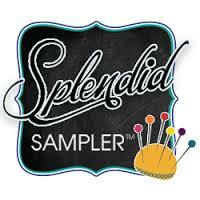 I am enjoying being part of The Splendid Sampler. I'm going on holiday for 2 weeks ao will have some catching up to do when I get back but I am taking 4 blocks which either need the embroidery finishing or need applique stitched down. I tend to use whatever needle is to hand in what feels like the right size. What size do you use? I had the reverse reaction. I read the instructions about 6 times and said to myself, " I've done this all before. No problem!" Every problem was a stupid problem on my part. I put the wrong color on the wrong side, cut the wrong size of something, etc... The designer did a great job, I'm the one that managed to make my own problems!